Advances on the Western front of my painting have been slowed by diversionary manoeuvres in the studio as I grapple with the last stages of preparing the memorial for Westminster Abbey. As mentioned previously we no longer speak of war. Hence this Conflict Memorial will be unveiled, with much fanfare and bemedalled dignitaries in full uniform, by a royal personage on the 29th October. After much sieving and grinding with pestle and mortar I have my pigment ready, a mixture of earth from the world's battlefields. 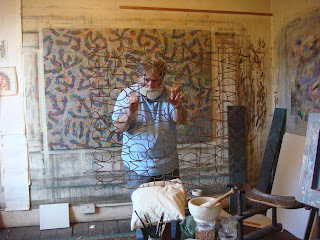 It is tricky to paint on round sectioned wire with its four dimensions, back, front, sides and the bit-out-of-sight-one-always-seems-to-miss. Meanwhile at the Abbey itself, locked in a little worker's lean-to, Phil Surey is chipping away at the cloister wall to carve the lettering that frames the metal centrepiece. It is uneasily strange to be celebrating warfare (I have not yet learned to say conflictfare) but the artistic problems remain the same; of probity in design, truth to materials and the combination of these with propriety to the subject, to present a unity. Asked to make a statement describing the work for the upcoming occasion I tried to imagine what would make sense for the bereaved (and the comrades and friends) of the fallen, for whom the memorial should carry most meaning. This memorial takes the form of a text (adapted from that provided by the Armed Services Memorial committee) worked in welded steel so that the letters of which it is made support and strengthen each other in free space. With this structural interdependence and the presence of steel, the generic material of ordnance, a military metaphor is tacitly present. This is symbolically reinforced by the overall covering given to the metal which is made up from earth gathered world-wide (with the assistance of travelling friends) from various sites of conflict. These date from 1066 (Battle itself) via Agincourt, the Somme and onwards to the present day. Fifteen such earth samples were mixed and ground together to make a pigment bound in colourless acrylic resin. Thus, in an echo of Rupert Brooke's famous poem, "some corner(s) of a foreign field" are brought to an appropriate place to indicate the long ancestry of national courage. The not unexpected resemblance in colour and granular texture to rust could be thought quietly to voice the artist's hope of an ultimate peace. Framing the metal sculpture and beginning similarly with the all important word 'remember' is the motto of the Armed Services Memorial Appeal carved into the fabric of the Abbey itself, a stone that is the same as that used throughout the world by the War Graves Commission. The carving is made as deep as is practicable to catch the maximum amount of defining shadow. The services and their dead are memorialised in bonded steel, camouflaged in the earth of battle, with a surrounding call to remembrance marked in sanctified stone. I am of course invited to the ceremony though, looking at the embossed card I am not sure what, for an artist, 'full dress uniform without sword' might be. Well, "without sword" is easy enough, but choosing a suitably full dress could be tricky... I'd give it a miss, if it's going to be that sort of occasion. Going "off topic", as we say, I've just acquired a copy of Tom's print "Benches", and I'd be grateful for any advice from the office on framing -- what approach would you recommend? Going even further off, and veering very close to shameless self-promotion, I have recently started my own modest blog, which happens to mention TP today. Anyone who hasn't already got enough ways to pass the time is invited to another ongoing party at www.idiotic-hat.blogspot.com !